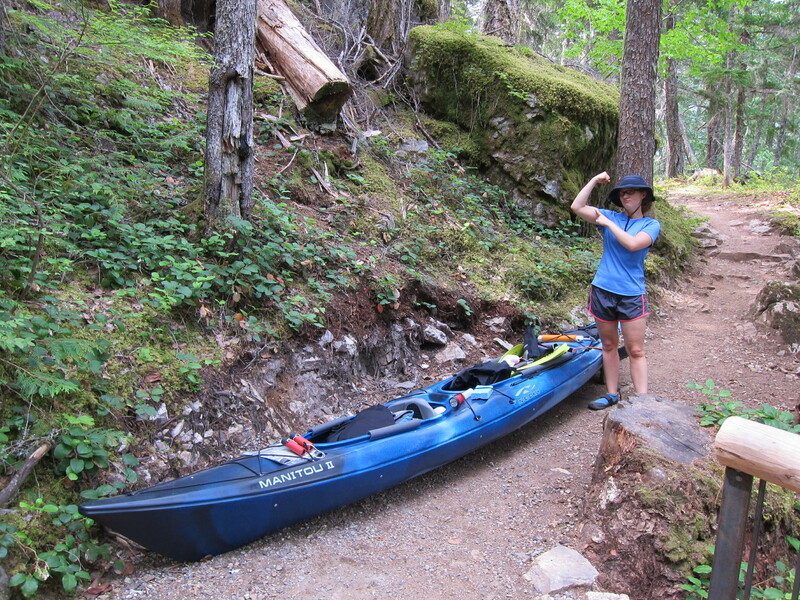 Our most embarrassing, and most kayak relationship strengthening, misadventure was our trip to Ross Lake, August 2014. Ross Lake is only accessible by a road from Canada, a hike at Ross Dam Trail, or Paddling Diablo Lake then taking a truck. We had a plan. We printed maps, timed everything, practiced packing all our camping gear in the kayak. Right after work we drove to the Wilderness Information Center at Marblemount to pick up our backcountry permits for a campsite about nine miles into Ross Lake. Because we couldn’t leave early we made it to the Center at closing time and got the last campsite, but we had our permits, we were legal. 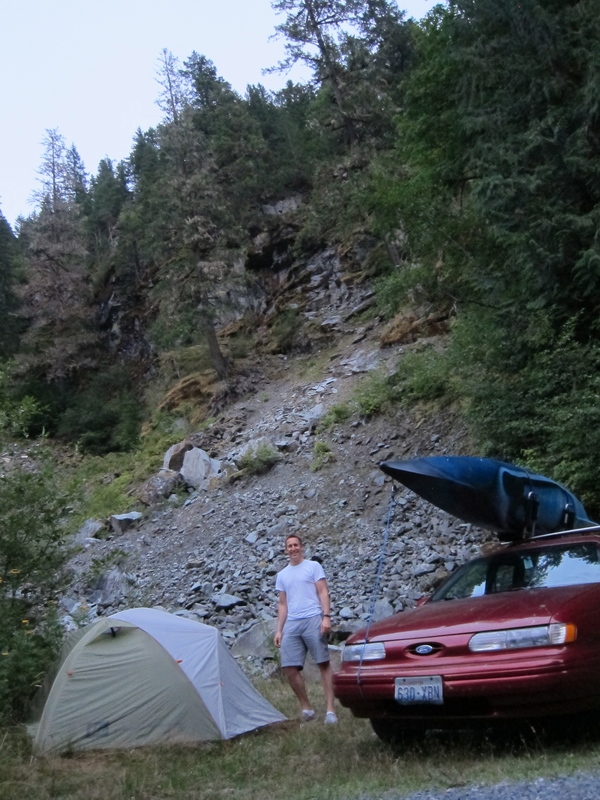 We drove into the forest roads and found a good spot to park and pitch our tent. First thing in the morning we drove to the parking lot by the Ross Dam trail head (mile marker 134 on Highway 20) and loaded our kayak. According to our online research the trail was an easy hike and only about a mile. And we had a cart. The 500-700 foot elevation loss (per a blog I can no longer find) sounds like a good downhill hike, but what we didn’t know is that’s the net elevation loss and in reality there’s quiet a few ups and downs before getting to the end. We also didn’t know how narrow the road was, configured mainly as switch backs, not allowing us to turn the kayak in many spots, requiring us to lift it over the mound of dirt, with kayak/gear/and all (I’m guessing 130-150 lbs). To make life even more fun, on the straight parts of the path there were too many large rocks to use our wheels the majority of the time, so we had to physically carry the kayak, despite our height difference of 9 inches. I’ll admit, I spontaneously broke into tears twice, but we kept pushing on. We didn’t take many pictures (the one above is to show our elevation loss…maybe at the halfway point) because our fingers were too tired from carrying the kayak, and our skin didn’t want to touch anything from being rubbed raw, even through the gloves. By the time we made it to Ross lake our entire bodies were sore to the point of collapsing but we got in at the lake and started towards our campsite with our paddles lying in the crook between our thumbs and index fingers, too weak to wrap our fingers around the shaft. A mile against the wind later I made a judgment call. I would make it to the campsite and we’d manage to build our tent and make a meal, but I didn’t know how I’d make it back the next day. 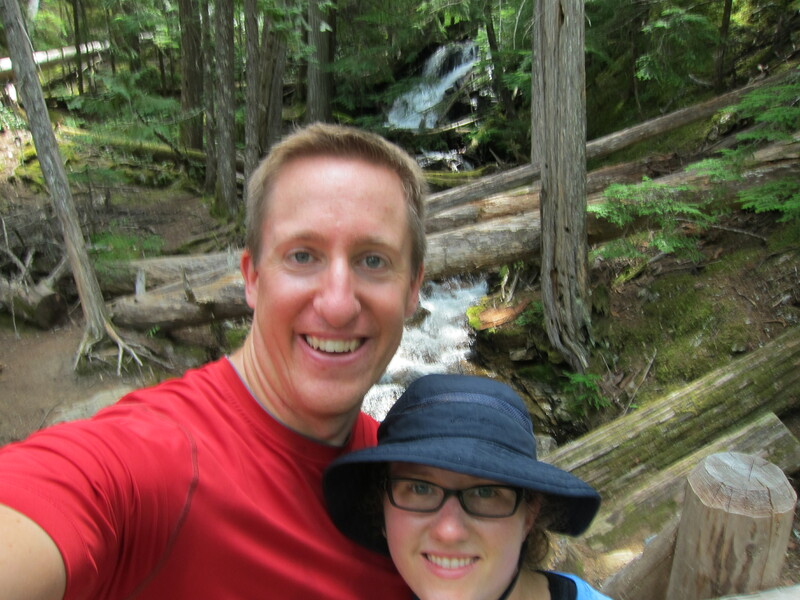 We explored the area a little bit more before catching a truck (through Ross Lake Resort) for $30 to Diablo Lake. 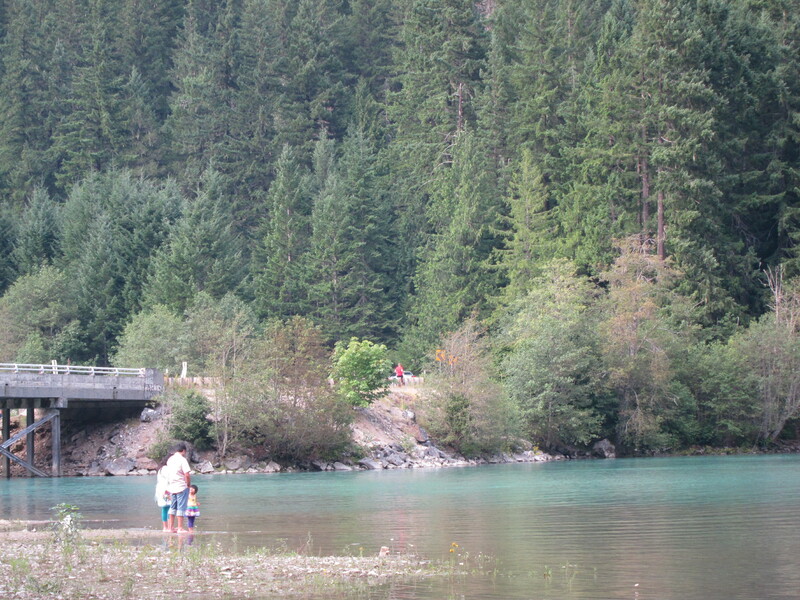 We didn’t have a map of Diablo lake but had been on it once before, so we made it to Colonial Creek campsite just fine, amazed by the crystal clear water for all 4-5 miles. It had been so windy the other time we’d done it. The problem was the campsite and our car were 5 miles apart. So I sat in the kayak while Alex ran, in his crocks, to get the car. His foot was so painful he went to the doctor to get an x-ray and the co-pay wiped out our $30 savings from our hike (opposed to taking the truck TO Ross Lake). The red dot in the center of the picture is Alex running (uphill) from Diablo Lake. 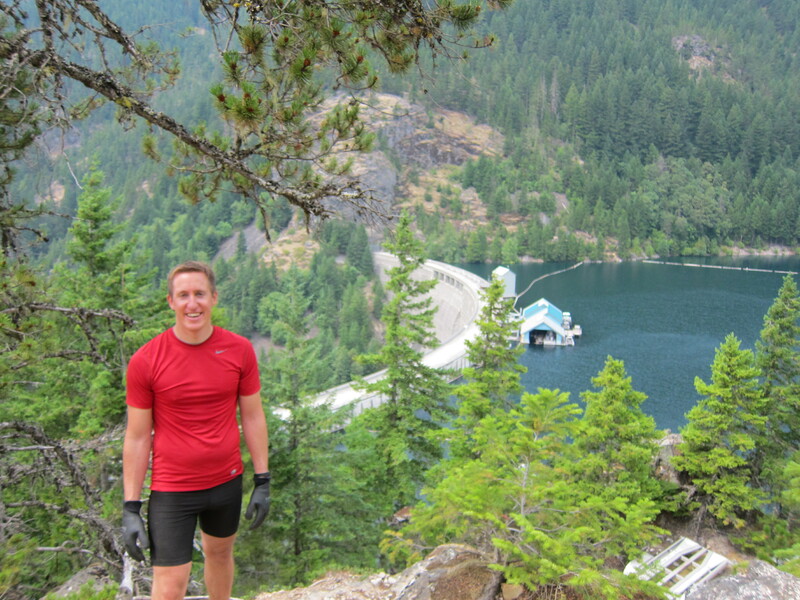 Lessons learned – when we do Ross Lake this memorial weekend we’ll be taking the barge. Update: for the memorial weekend Ross lake trip see this post. Thanks a lot Larry! Glad you’re enjoying the blog! !